By lavender at Jan. 21. 2019. It is a jungle out there this year. With all of the rain and sunshine not only the weeds are growing like weeds but many plants that bloom infrequently have blossomed out with a glorious show. Some oddities are also appearing. We presume that plant breeders spend years crossing and recrossing plants to produce different colors and forms of flowers and often they do. Sometimes Mother Nature does the work for them. Years ago I plant woods hyacinths (Hyacinthoides hispanica) aka Spanish bluebells. They are a charming little bulb that is one of the first things to bloom in the spring. I planted a number of bulbs and as expected they bloomed blue. After a number of years I started to get pink ones and then white flowers appeared. They were reseeding and spreading and the new plants were recombining genes and producing different colored flowers. The same thing happened with the forget-me-nots. The blue flowered plants were going to seed and pink and white ones started to appear. I moved some of the white ones to an isolated area and that small patch now produces almost all white flowered plants. I think that I have mentioned that the rose campion (Lychnis coronaria) has done something similar. This plant had a deep magenta flower. Because it has a fuzzy silver leaf and is fairly well behaved I have let it reseed at will. 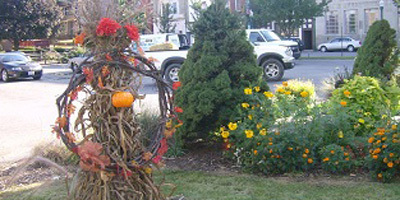 It has taken up residence in some areas where more needy plants do not survive. These areas being dry and compacted are not suitable for much except weeds so anything else that grows there is more than welcome. Mother Nature has undertaken a breeding program with the rose campion, as well. For the last several years white flowers have been appearing. The catalogs dub these Lychnis coronaria ‘Alba’. The form that is appearing in my garden has a pink center and appears to be a cultivar known as ‘Angel’s Blush’. There are several other colors out there including a pure white one and a white and carmine one and even a double one. I’m waiting to see if any of those appear. Meanwhile, the growers are capitalizing on plants that appear naturally if you just wait long enough. 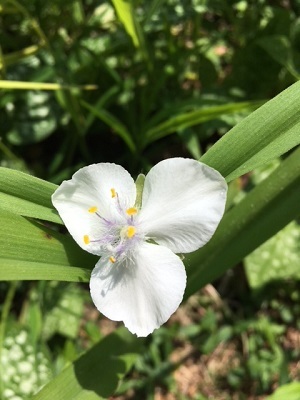 I looked out the window a couple of weeks ago and there among the spiderworts (Trandescantia) was a white one. While there are several spiderworts native to the eastern part of the US. the only one I had growing in this area was definitely not a wildflower. It is a variety known as ‘Sweet Kate’ and has bright yellow leaves and dark purple flowers. For the last few years I have been getting plants with plain green leaves and flowers ranging from pink through various shades of purple. Across the yard at quite a distance I have a magenta one that was bought many years ago and remains nameless. Growing near this one is a smaller variety known as ‘Bilberry Ice’. This plant is highly susceptible to a water mold, Pythium, that turns the leaves black and rots the roots. The pale blue/lavender tinted flowers are unusual and attractive and hopefully it will make a comeback since it has been moved to a dryer area. The plain green spiderworts with dark purple flowers have been appearing in this area as well. It seems that all of these colors are part of a breeding complex known as Trandescantia x andersoniana. It is made up of the three native species T. ohiensis, T. virginiana and T. subaspera. It seems that spiderworts are quite promiscuous and do not come true from seed. If you find one of a different color in your garden all you have to do is assign a name to it and you have a new cultivar. As long as you keep dividing it the plant will remain the same color. There is no telling what its seeds will produce. 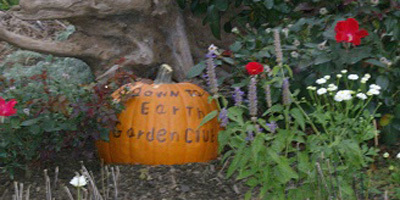 Many of the garden club members are growing Companula ‘Elizabeth’. This is the pretty mauve/pink bell flower that grows quite prolifically. It is also known as Korean bell flower and taxonomically it is Campanula takesimana ‘Elizabeth’. I also grow a double white one known as Campanula cochlearifolia ‘Elizabeth Oliver’ . It doesn’t bloom reliably and it is the rare year that there are any flowers. 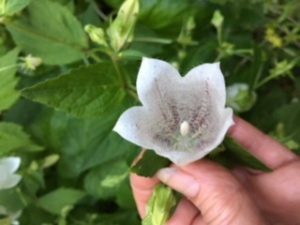 So what to my wondering eyes should appear this year but a single white bellflower that is just like ‘Elizabeth’ with the same markings but not pink or mauve but a white. Is it a cross with ‘Elizabeth Oliver’, a mutation or just a lurking recessive gene? Woodbridge Nursery and several other online catalogs list Campanula takesimana alba, which looks very similar. 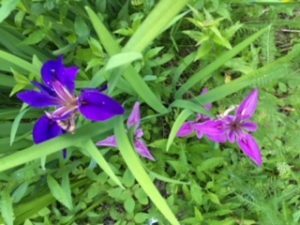 And last but not least and most mysterious of the oddities that have appeared this summer is a beautifully colored iris the like of which was not planted and came from who knows where. 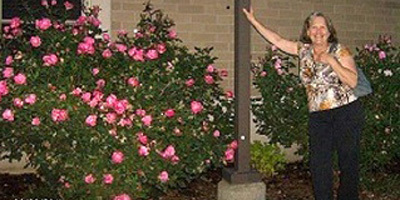 Many years ago a garden club member contributed what he said was a Louisiana iris. Louisiana iris is applied to 5 different species Iris fulva, Iris hexagona, Iris brevicaulis, Iris giganticaerulea, and Iris nelsonii. All will interbreed resulting in a wide range of colors. As the name suggests Louisiana iris are native to the south, most specifically to the stream sides and boggy areas. These iris like wet feet. While they will grow in our area they are marginally hardy. Most sources suggest that zone 6 is their northern limit which would mean a hard winter in our zone 5 region would kill off the rhizome. This one however was hardy and I naturalized it in a spring fed area that stays damp. It thrived and I find plants springing up in areas where I did not plant them. They are all, however, the original purple that was planted.